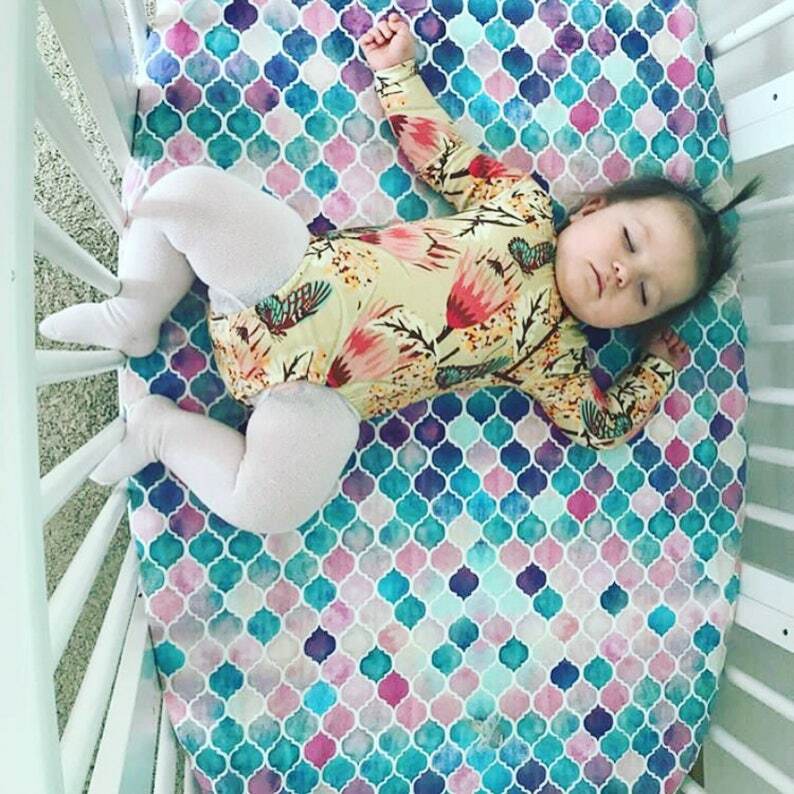 We offer: A variety of sheet sizes (bassinet, 4moms, custom, crib, stokke, leander, ikea toddler) changing pad covers, boppy pillow covers, boppy loungers, minky baby blankets, crib bumpers, crib skirts, rail guard covers, curtain panels, and decorative pillows. This collection offers arrows, feathers, floral, deer, and owls in purple, pink, mint and white. See sizing and descriptions below. -Customize your own bedding set by selecting the item(s) you are wanting in the drop down menu. -If you want multiple items you will need to add each item to your cart with your fabric # selection. Then you may check out and add any additional notes to me in the "Notes to Seller" box on the checkout page. -If you have different dimensions than what is listed below, you may list your dimensions in the "notes to seller" box and select the item that is closest in size in the drop down menu. Please feel free to message me about any questions at all! You will be in love with how cute these DockATot deluxe and Grand covers are! Little Moose By Liza designed a very user friendly and washable cover. It has a handle on the side for ease of carrying around. It has a large tie at the bottom to adjust the bottom of the cover, that can be tied in a bow or knot for extra style. An envelope style closure on the back of the cover makes it easy to slide the bottom pad in as well as any type of waterproof mat you might want to use for protection. There is a zipper 3/4 of the way around the tube so that you can remove the cover for easy washing. Not to mention these fabrics are oh-so-soft against your baby's sweet skin! The Deluxe Cover fits the Deluxe and Deluxe + forms from DockaTot, the only difference is the Deluxe + Covers have loops for the toy bar they sell. If you would like to add loops onto your cover, please message me and it will be an additional $10. You can choose fabrics from any of our fabric listings, including our organic section, the pricing may change with your fabric choice. Message me for a custom listing. You can select 1, 2, 3 or 4 rail covers. This will depend on the style of crib you have. The long rail cover is 8"x52", the short rail covers are 8"x27" (if you need your rail covers wider please message me to see if you need a custom listing). You can also select a scalloped long rail cover, with ruffled trim. You can specify which color ribbon you would like used for the ties or I can choose for you if you do not have a preference, we offer: white, ivory, light pink, peach, coral, navy, gold, gray, mint. My experience was great. Product was as advertised and shipped in a timely manner.